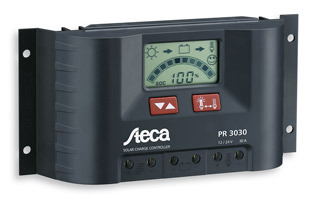 The Steca PR 10-30 series of charge controllers is the highlight in the range. The latest charging technologies, combined with a Steca-AtonIC state of charge determination which has been significantly improved once again, result in optimal battery maintenance and control of the module output of up to 900 Wp which can be connected to it. A large display informs the user about all operating modes with the aid of symbols. The state of charge is represented visually in the form of a tank display. Data such as voltage, current and state of charge can also be displayed digitally as figures on the display. In addition, the controller has an energy meter which can be reset by the user.